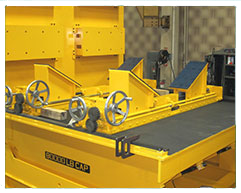 HYDRAULIC UPENDERS by Bushman Equipment upend coils, molds, dies, paper rolls, cylinders and other heavy, bulky loads and turn them within a 90-degree radius. Hydraulic coil upenders handle heavy jobs smoothly and efficiently. North American Sales Company, Inc. represents Bushman Equipment in California and Nevada.